As race day got nearer I started to keep an eye on the weather. I think knowing the forecast for a session, a long run, or a race is something every runner tends to know. Sure it could be raining on 40mph winds on race day, but it’s something that’s nice to avoid when possible. 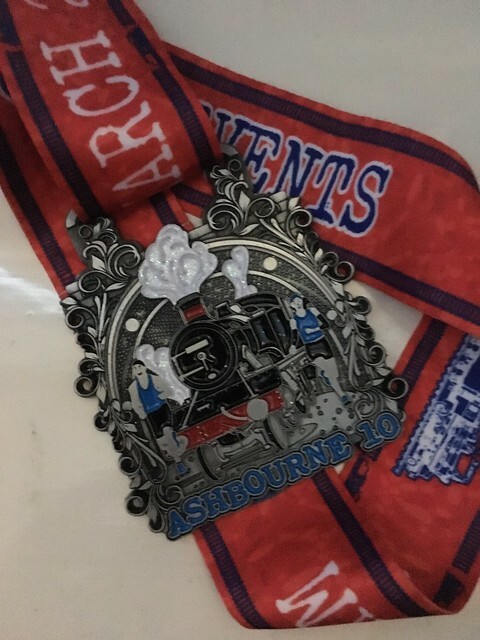 I first ran Ashbourne 10 just two years ago, and didn’t do too badly. I think the weather that day had put a lot of people off, and somehow I actually finished with my only trophy to date. This being the Peak District, you never know what the weather is going to be like - no matter what the forecast is. It’s similar to Norway in that regard. The following year instead of rain, it was snow, and it had to be delayed by a few weeks - enough for there to be a better chance of ‘good’ weather. Sure enough that is what we got. This year we’ve not really had much snow in this part of the country, and with the hottest February on record it looked like Ashbourne could be a scorcher. Even as close as the Monday before the temperature was in double figures, the air still, and the sun shining. As we got closer to the weekend the forecast changed to be raining and windy. The rain is fine, but the wind could be a problem. That didn’t bode well. So it seemed like the conditions were going to be tough so I decided I’d aim for around 90% effort. With a half marathon just six days later I wanted to make sure I’d be recovered and ready for that. It was now five years to the day since I got my first ever running watch. On the morning of race day the weather forecast had changed again and it looked promising that I’d get through the race without wind or rain. It had probably rained cats and dogs all night, but maybe the Tissington Trail would dry a little by then. When I reached Ashbourne the sky was looking a little grim, and I was certain I’d felt a spot or two of rain. I couldn’t feel much wind though - so there was always that. This time there was a good gap between the Canicross runners and the 10K runners - except for a few stragglers that started late. I found myself on the front row at the start and held second place for all about two minutes. Once I’d reached the half kilometre long Ashbourne Tunnel there were another three runners that caught up and overtook me. It hadn’t taken long at all to drop back to fifth - looking at my watch I was stupidly doing 5:55/mi which was too fast anyway. I eased off a little to make sure I’d be able to hang on a little longer. I really can be an idiot at times. After the tunnel was the cycle centre, and then a sharp dip where you need to run down hill and then back up on the other side. Apparently there used to be a bridge across there, but now it’s just a fun hill climb for runners. We’d been forewarned that the trail may be slippery in places due to the rain, though so far it hadn’t bothered me at all. This changed at the top of this hill when I managed to slip in the mud, though was able to use my hands to save myself before hitting the ground. I was fortunate - I’d not lost any time, and instead of looking behind me I kept looking on and made sure that runner in front of me hadn’t gained too much ground. I was hoping that later in the race I might just manage to catch them up. After settling back into a steady pace I found I’d jarred my neck a little from the sudden action; but I didn’t want to risk stopping to stretch it at all. My hands were feeling cold too - but I figured that wouldn’t be the case for much longer. My watch told me I was doing 07:30/mi now - not good. After the first mile I looked at my watch for the third time this race - apparently my first mile had been covered in 06:30. It was about ten seconds slower than what I’d normally do, and about fifteen seconds slower than I’d have liked. Before the race I’d been talking to Gen about race plans, and had said that if I’d wanted to PB by even a few seconds I’d need to be hitting a 6:15/mi average. That wasn’t happening. I couldn’t figure out why this was already feeling like hard work - I was starting to breathe harder already. After passing the turnaround point for 5K runners (who had not yet set off) I found myself wishing I could have turned there and ran back to the finish. I carried on until I reached two miles, and then walked briefly. I took the opportunity to properly stretch my neck, and looked behind - I couldn’t see anybody. I then chased after runner #4 who was now overtaking a Canicross runner he’d caught up with - I was still hoping not to lose sight of him. There hadn’t been many to overtake early on, but as I got closer and closer to the halfway point I was finding I was needing to dodge not just ones I was overtaking, but oncoming ones too. That’s the thing about Canicross - you never know when a dog might decide they want to run after someone else. In this first half I found myself slowing again in one of the particularly muddy sections when I caught up with another Canicross runner, but had to wait for an oncoming one to pass first. I think with these sorts of races you have to plan ahead a little so you can time catching up with when it’s safe to pass so you don’t need to slow too much. I’m not saying this is a bad thing - it’s an extra challenge, and keeps it interesting. However it’s one which has so far made it difficult to PB on this course. I think for now I will only be beating that on road races. At the turnaround point I slowed to a walk to ensure I wouldn’t slide, and then waited a few more seconds after turning before starting to build the pace back up again. After the first half had felt tough, it was starting to feel easier again. There was a sudden realisation that it wasn’t just the walking break either - every time I run this race I forget that the first half is entirely on a gradual incline. One day I’ll remember this during the first half, and plan accordingly instead of letting it get to me. At least the gradual incline hadn’t been as bad as the ones I’d experienced just a couple of weeks previous in New Zealand. Training there had been tough, but I think it’d been worth it. For the second half I found myself running mostly at a steady pace, quicker than before. I even such Ash Wilks who was doing the 10 mile distance, and gave him a ‘high five’ on passing. Now the obstacles were mostly runners still on the outward part who hadn’t paid attention to the instructions to “keep left”. Even the course had signs saying “keep left”, yet still some runners were running three, four or five abreast, making it difficult for those of us now racing towards the finish. At least when I was overtaking Canicross runners most would try to create some space for me to pass, though of course as I said earlier, sometimes it’s not possible to predict where a dog might go if they see something they want to chase after. One did get distracted and closed the gap I was running through, but I got lucky and was able to slow down a little to wait for a gap in the oncoming traffic. Ahead of me someone else hadn’t been so lucky, but I didn’t know that at the time. Amongst the three running together in the front, one had been tripped by a dog that had started to run after the cameraman. All I knew of this was what I’d later witnessed at the finish when I encountered two runners arguing. Anyway, it was now the dip in the trail which meant I’d not got far to go. The last two miles had averaged less than 6:15/mi so I was doing well. Looking at my watch one last time I wondered if I could get anywhere close to my current personal best - was it worth risking the half marathon for a quick attempt now? I decided it wasn’t worth the risk. I took it easy on the descent, making sure I didn’t slip on any of the mud I’d slipped on previously - and then walked up the other side. This time I’d done it without the “oops”, so at the top I carried on running and started to pick-up the pace a little to try and ‘make up’ for the time I’d just spent walking. By now I could only see 5K and Canicross runners in front of me - the four 10K runners I knew to be ahead of me were too far ahead to see. I overtook a couple more, and entered ‘the tunnel’. I knew I’d speed up in here - I always do. This time though I thought of the kilometre long tunnel at Karangahake Gorge - at least this one seemed to pass by quickly. I then couldn’t remember how soon after the tunnel the start had been so wasn’t willing to speed up to a sprint. After all, it’d be good to save my legs for the half - as long as I didn’t do anything stupid in training during the next week. At last I crossed the finish line, removed the timing chip, and collected the medal. It’d been a fun race, I think partly because it’d kept me on my toes. Just like last time, I finished 5th, though this time I’d got an official time of 40:08 - so over half a minute quicker than last time. It's a little disappointing it's not sub-40 when so many recent 10K times have been; but maybe I should take some solace from being 5th out of 245 finishers. I suppose that's not too bad really - and it was an age category win. I think I'm getting old. So, maybe it’s not a PB; but it’s the best time I’ve done on this course. I think considering how training has gone this year, it will be interesting to see how things go next week. Perhaps ‘Storm Freya’ will have passed by then. I can only hope. Thanks to Marc Dewhurst Photography for the FREE race photo, and thanks to SBR Events for another fun event.